Get in the mood for Halloween at Grande Vegas Casino with a 25% deposit match bonus, plus 100 free spins on the Count Spectacular Slot. Claim your 25% match bonus and your 100 free spins now. You can claim up to a maximum of $100 when using the 25% deposit match bonus. 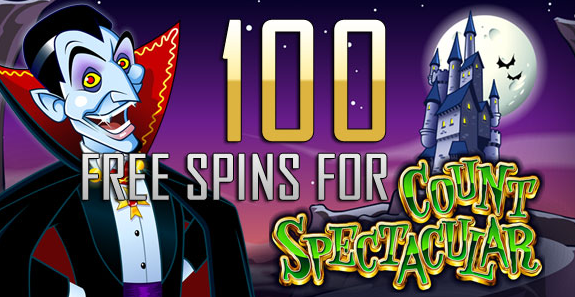 The 100 free spins are played on the Count Spectacular Slot and have a play through requirement of 30 times. Be sure not to miss out on this early Halloween bonus at Grande Vegas Casino. Don’t forget that you can also claim a free $25 bonus once you have made at least one successful deposit this October. Sign up and play with these casino bonuses at Grande Vegas Casino now! This entry was posted on 6 October,2015 at 6:21 am	and is filed under Account Holders, Deposit Bonuses, Free Bonus, Free Spins, New Accounts, RTG. You can follow any responses to this entry through the RSS 2.0 feed. You can leave a response, or trackback from your own site.